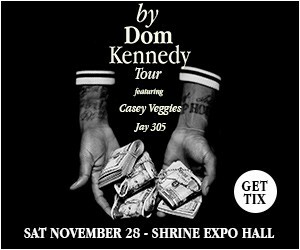 Want to win a pair of tickets to see Dom Kennedy on his “By Dom Kennedy Tour” Tour with Casey Veggies and Jay 305 at the Shrine Expo Hall on November 28th? 3. Comment below the flyer tagging a friend you want to bring with you to the show. We will select a lucky winner and contact them directly through Instagram, so make sure to keep an eye on your inbox! Find out more at hiphopdx.